I have created an App launch to my FHIR app in the sandbox and am able to access Patients that are provided in the Sandbox. 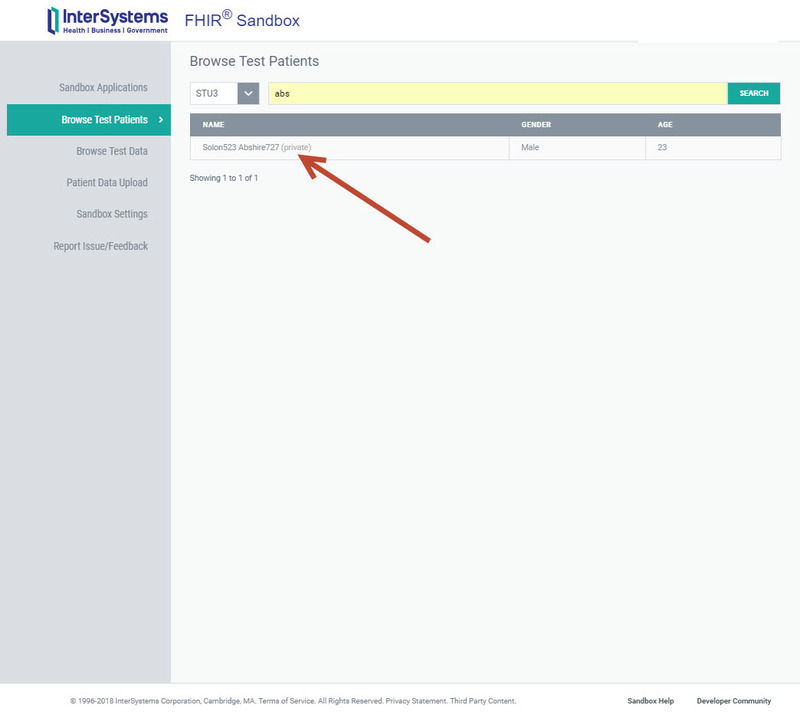 Having done this, I would now like to upload a test patient in a FHIR bundle to the sandbox, however I have not been able to find out how I can do this. Can you provide some direction/tools that I can use to upload my bundle to the sandbox? 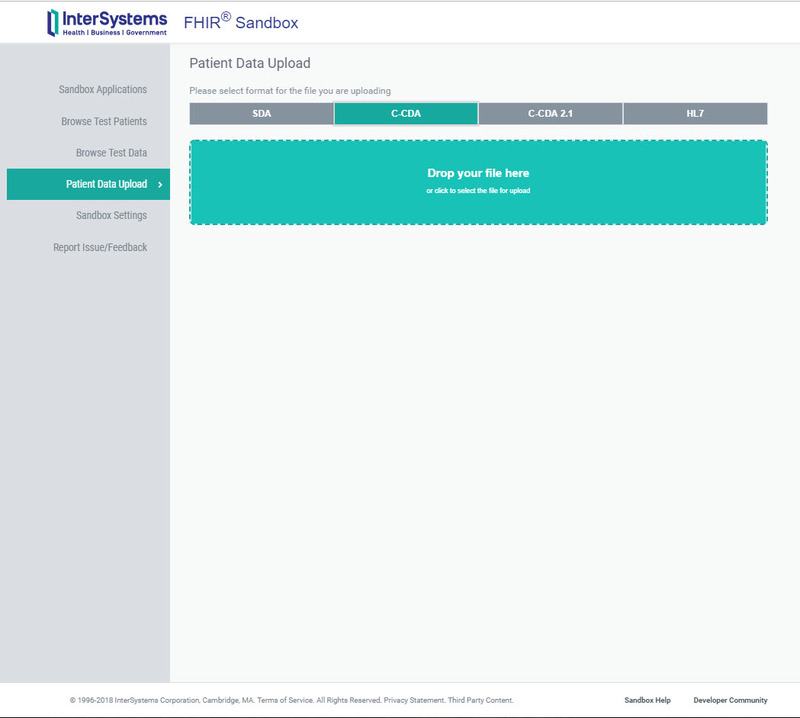 Currently the FHIR Sandbox supports the following formats: InterSystems SDA, C-CDA 1.1, C-CDA 2.1 and HL7 V2. It does not support uploading test patients using FHIR DSTU2 and FHIR STU3 at this time, but those are planned. Only use test patient data only. 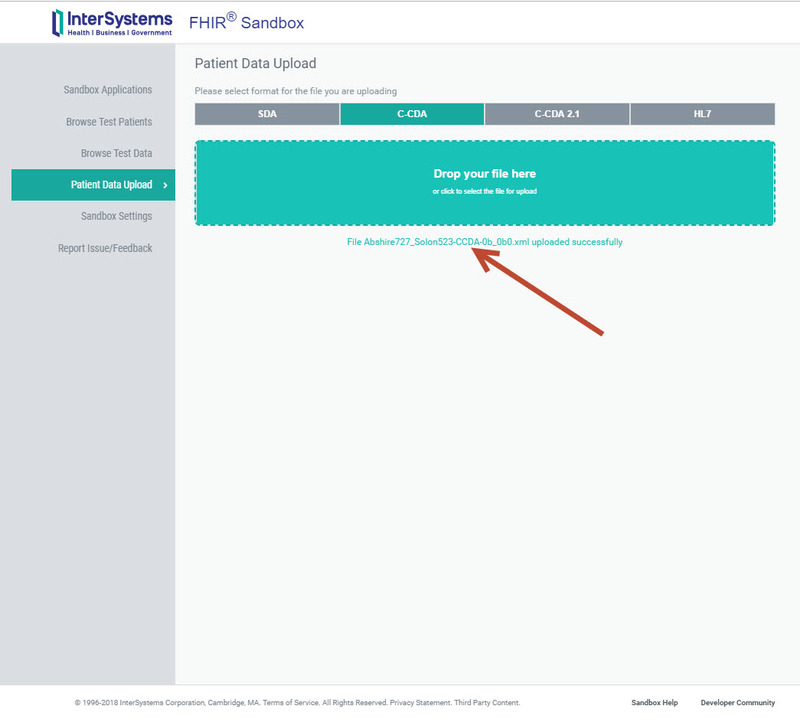 Please don't upload real patient data or any other inappropriate data as outlined in the FHIR Sandbox Terms of Service. 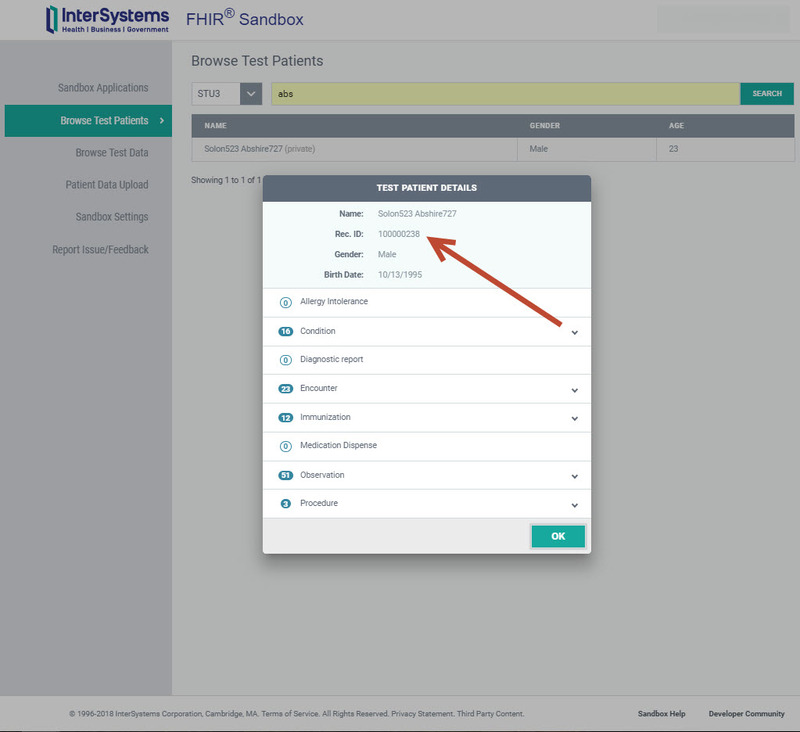 Test patients that users upload are only visible to them, and no other FHIR Sandbox users. These patients are indicated by the label "(private)" on the Browse Test Patients search results page. 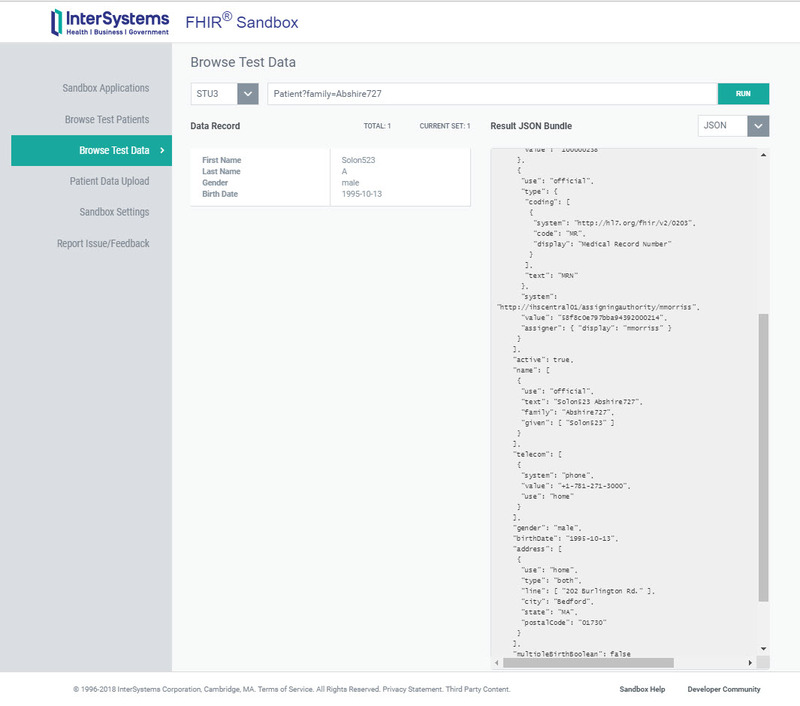 InterSystems will periodically reset the FHIR Sandbox environment and remove any test patients users have uploaded. Currently this period is set to 30 days, but it can be run at the user level or the environment level on demand (i.e. in the event a user uploaded incorrect data). Thanks for the response Michael. I was able to upload a Synthea (TM) generated patient. However I need to have a FHIR resource attribute (verificationStatus) set to "confirmed " , CDA does not support this, so when I retrieve the data from the server the fhir bundle sets this to "unknown". I look forward to when FHIR bundles can be uploaded. We're looking for a work around. Which bundle are you working with regarding VerificationStatus - Allergy, Condition, etc.? So for this test patient we would be able to get by, by setting all verificationStatus' in the Observation and Conditions resources to "confirmed". We would also need to set all status' to "final" in the Observation resource.